The past few days have mostly been a blur of eyebags and a lack of sleep, plus my camera is still not fixed. MOS with Addie, Phebe, RachelNg, Camille, Sherry, Angel and Jesslyn. Wah the bouncer asked me to write my Chinese name for him and obviously I couldn't, luckily he still let me through. Phebe and Camille slept at my house that night! We came back and cooked maggimee and sausages! Anyway, Sophie and Camille ROLLED all the way into my BED SPACE and began pushing me to the wall. So I spent my entire sleeping time STUCK SO CLOSE TO THE WALL. Plus both pulled the blanket away and Camille stole my pillow. Sophie and Camille sleep like LOGS. They stayed in the same position for like FIVE hours. OMG, what horrible friends. HAHA. Rubbish lorz, it's all Camille's fault. She was in the middle, when she pulls the blanket away I have no choice but to squeeze inwards further what. Prom! Okay in the end it wasn't as big a deal as expected. It seems as though we paid money to just go there and get the thing done as quickly as possible and then to be shoo-ed out of the room. 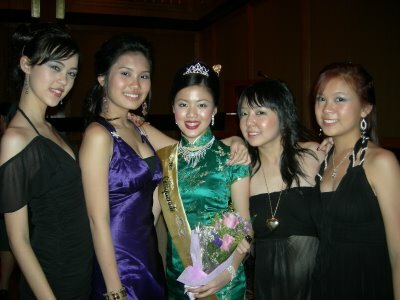 Prom queen in the centre! Cocolatte after that, it was a little weird because the place was quite empty. That means no neck-crushing jostling on the dancefloor but then the ambience was less hyped up. Addie and I smart girls, we stayed rooted to standing on the podiums where no one can come bother us. Random guy TRESPASSING IN OUR SPACE: "Eh I've got no space!" Slept at Waterfront Hotel that night, never mess with a long-haired pale Sophie in the night, especially when she's armed with a torchlight under her face. Phebe, Camille, Addie and I lazed around at the hotel cafeteria for a while. Went down to Zouk in the evening for a runway show I was doing. We had to walk down holding stuff like cameras or wearing watches, the show itself was relatively short yay. One of the other girls had a GUM piercing, it was quite surprising haha, never saw one before. 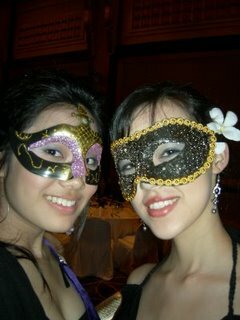 It's a mere hour away from our SSS-masquerade party and I barely have the drive to get dressed. Tons of people jsut backed out on us last minute and if we could cancel we would have.